Perhaps by our time, they had come up with a concentrate; but it’s no longer made. 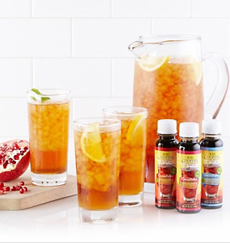 There are other brands filling the void—in fact, the biggest user of iced tea concentrate is foodservice (restaurants, delis and other businesses that provide prepared food). Yes, fellow iced tea lovers: The majority of iced tea served in U.S. restaurants isn’t fresh brewed from leaves. Most of it is made from a tea concentrate: just add cold water to the liquid, toss in some ice and serve it to the customer. The fastest way to quality iced tea: Just mix concentrate in water and add ice! Photo courtesy B. W. Cooper’s. Not that there’s anything wrong with that: Tea concentrate is a quick and easy way to serve large quantities of iced tea—or make just one glass, if you’re so disposed. It’s not a lesser product: There are good tea concentrates and mediocre tea bags. We recently made the acquaintance of four flavors of B.W. Cooper’s Tea Concentrate. Among his other activities, company founder Barry Cooper is the tea master for Gevalia teas. There are 32-ounce bottles on Home Shopping Network and 64-ounce bottles at Sam’s Club and Coffee.org, the biggest selection we found. If we do the math correctly, the large format makes 16 gallons of tea (if you’re a big iced tea drinker, that goes pretty quickly). There are also mini bottles: four ounces of concentrate that make one gallon of tea. We like them as small gifts, party favors and stocking stuffers. For more information, check out the company website, CooperTea.com. Find more of our favorite teas in our Gourmet Tea Section. *The principal sweeteners are non-caloric sucralose and acesulame potassium (ace-K—details about these sweeteners). But there‘s no artificial flavor. There is also a bit of corn syrup (not HFCS), which the company says improves the mouthfeel.